The latest report on consumers’ credit utilization from the Federal Reserve showed that Americans have become more willing to take on short-term debt. Specifically, total non-revolving credit, e.g. student and automobile loans, has risen for 53 consecutive months but on a year-over-year basis growth has somewhat stalled recently. At the same time, annual growth in revolving credit, which is mostly consumers’ credit cards, has accelerated. A similar report from CardHub found that $52.4 billion in new credit card debt was added during the fourth quarter of 2015, the biggest Q4 gain since the “Great Recession” and 42 percent above the recovery average. 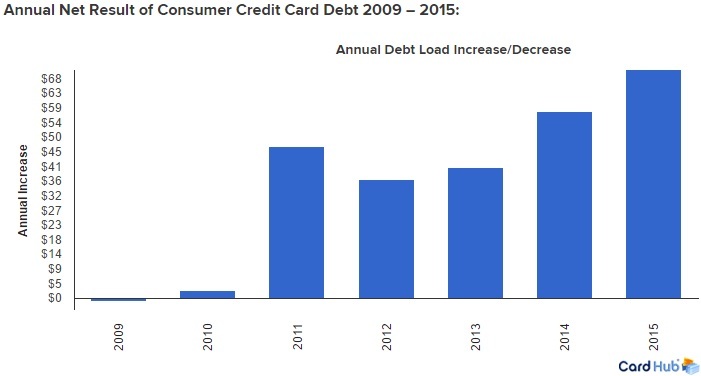 In fact, more credit card debt was added in Q4 of last year than in 2009, 2010 and 2011 put together. Rising credit card debt can be viewed as both a positive and a negative because even though it reflects a strengthening economy it can also result in greater financial stress for Americans down the road. CardHub researchers estimate that the average household credit card balance is now $7,879, the highest reading of the recovery. Charge-off rates, however, remain near historical lows and have actually declined on a year-over-year basis. This will not last forever if consumer spending habits stay the same and Fed officials continue to move forward with interest rate normalization. Indeed, an increased number of hikes will cause the interest expense for credit card balances to rise. This could force many Americans to try and pay off their ballooning balances more quickly, and therefore limit the amount of disposable income that can be put toward more important, long-term financial goals like saving for retirement.